You need the best fishing shoes and here, we will tell you why. Perhaps, one of the most neglected fishing gear for the majority of anglers is a nice and reliable pair of fishing shoes. 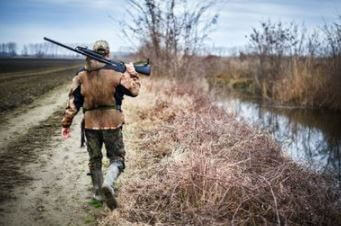 For many, what they wear on their feet is not nearly as important as their other fishing gear. Who has the time to look down at their feet when there is fish to catch? Little do they know that proper footwear is not just a matter of style. But, the best fishing shoes could seriously impact their health and safety. The improper type of shoes could get you to slip on wet surfaces. You would lose your catch or, worse, suffer serious injuries. Yikes! You are what you wear and if you wear dependable, efficient footwear, no doubt you will find yourself to be a better angler. But what does the right footwear look like? What is it supposed to provide you with? How does one even begin to look for the best fishing shoes? Well, worry no more. In this guide, we will show you what to look for and what you will need to consider before finding the right fit for you. We have even listed some of the best fishing shoes that anglers trust the most. Get ready to cast off and, with any luck, you might reel yourself in the perfect fishing shoes you have been looking for. In this section, you will find all the essentials that you need to consider when choosing the best fishing shoes. 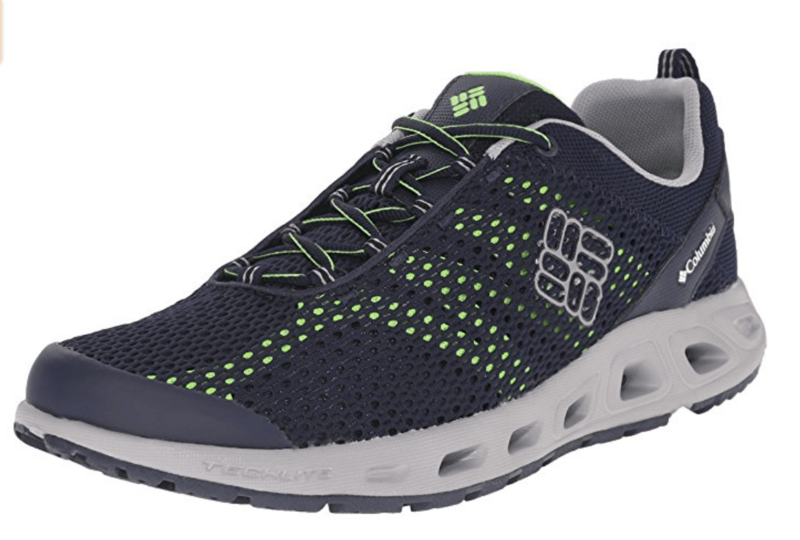 You need to look at a few factors such as the terrain, traction, material, cushion and comfort, waterproof, and style. All of these are important to finding the best fishing shoes. Continue reading to understand why you need to check out each of them. To no one’s surprise, different types of fishing require different types of fishing shoes. Where and how you are going to fish is an important factor to consider when choosing the best fishing shoes for you. There is no all-around fishing footwear that can handle every type of environment. Dedicated anglers know that the terrain in fly fishing is completely different from boat fishing so the specialized shoes necessary for both should have different features. 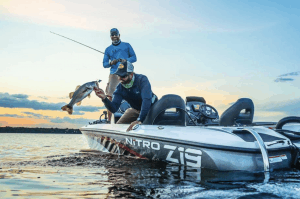 Whether the fishing vessel is a simple row boat or a small cabin cruiser, anglers would undoubtedly benefit from wearing lightweight footwear. The best fishing shoes for boat fishing should not hold water for too long and should be comfortable to move around in. In boat fishing, anglers usually sit down as they wait for their catch so breathable fishing shoes are ideal. This is very much like boat fishing. 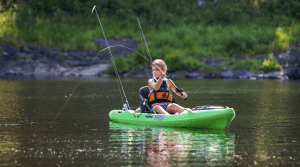 Kayak or canoe anglers should also wear lightweight shoes. It is important for their footwear to fit snugly on their feet. This is because kayak or canoe anglers would have to cross sticky and muddy terrain. You would not want to lose a shoe there, would you? This particular type of fishing requires a specific type of fishing footwear. Waders and wading boots are made for the purpose of fly fishing. This type of fishing shoes allow anglers to safely walk on wet and slippery rocks. Fly fishermen spend almost their entire days on water. Their wading boots provide their feet with the protection and insulation that the anglers need. For shore fishing, a simple pair of lightweight fishing shoes is all you need for this type of angling. This pair will keep sand out. The shoes should preferably be comfortable and breathable since you will need to move around the shore. The best fishing shoes are the ones that keep you steady on your feet, especially in rocky and slippery environments. 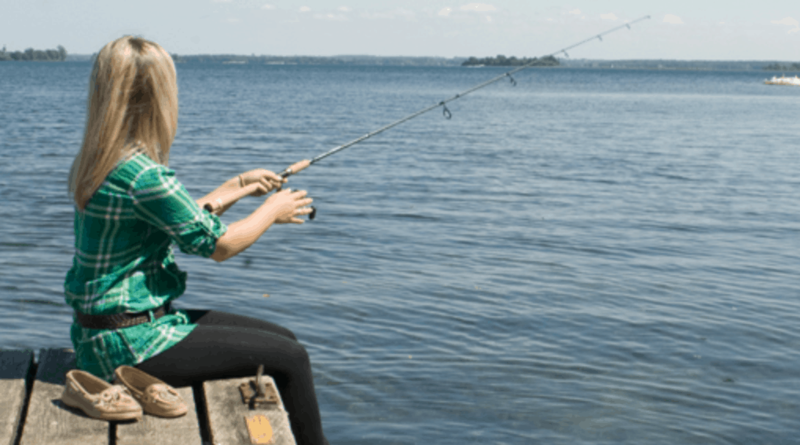 Your fishing footwear should help prevent any type of slippage. Because, you could possibly be getting in and out of your fishing vessel. You would also need a pair that will not track too much sand or mud. So, you must really take note of the soles of the fishing shoes. It could save you a trip to the hospital for all you know. It is a given that fishing shoes are going to get wet once you are out in the water. What your fishing footwear is made of should is definitely going to matter. You will need to look out for shoes made with strong but versatile material. The best fishing shoes should endure the soggy terrain for hours at a time. Typically, there are three types of material for fishing shoes: canvas, synthetic mesh, and leather. Canvas is sturdy fabric that is comfortable to wear but also provides ample resistance to the elements. Synthetic mesh are breathable, springy, and dries very quickly– an advantage in fishing. Leather protects your feet and keeps them dry much longer than other material. Whatever type of material you need for your fishing style is all up to you. When you are out fishing, you will need to move around quickly and stand still for extended periods of time. You will need shoes that can withstand that much action while at the same time keep your soles well cushioned. The best fishing shoes do not skimp out on good arch support and shock absorption. Of course the best fishing shoes should have some degree of water resistance to keep your feet dry. The health risk of having wet feet for long periods at a time is not a joke. No angler would want to get trench feet. 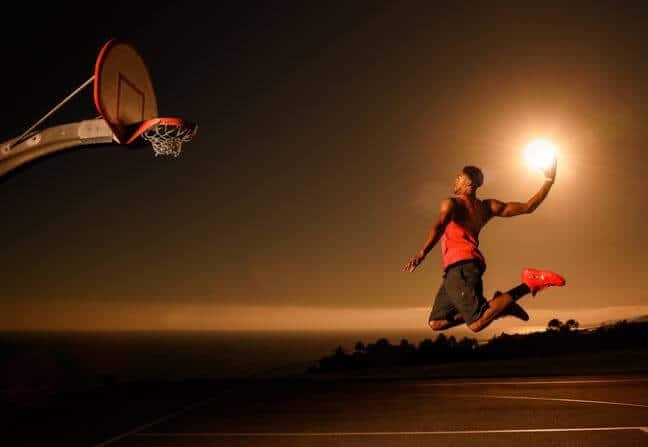 However, if you cannot get or do not prefer to get waterproof shoes – which do have some disadvantages – be sure to get fishing shoes that dries quickly and will not absorb water too much. Lastly, how the best fishing shoes look matter to the angler. Specialized footwear such as fishing shoes can be pricey. So, no one can help but want them to have some semblance of style. Luckily, modern anglers are blessed with a wide selection of fashionable fishing footwear that looks great on land and on water. In general, there are two styles of fishing shoes: slip on and lace tied. As the name suggests, slip ons are the kind of shoes that you can put on easily. They are convenient, comfortable, and stylish. However, there is the risk of it slipping off your foot if the size is too large or if you are not careful in walking across muddy terrain. Lace tied shoes, in this respect, are more reliable since you will need to tie them, securing the shoes in place. You should note that the style should not be your main concern, merely an additional factor. Though some types of fishing shoes are designed to look nice and classy (deck shoes, in particular), others value practicality than style. After you have learned the essentials of finding the best fishing shoes, we now come to the types of shoes for fishing. We have listed here the several types of fishing shoes you can find on the market. Also, we have included a few of the best fishing shoes available according to their type. We really hope this section can help you in your search for the best fishing shoes. Possibly the most preferred type by anglers, boat shoes are constructed specifically to be worn on deck. Featuring water repellent material and offering great grip and traction, you can see why it is so popular among anglers. Boat shoes are typically well cushioned, absorbing shock from waves or from moving around on deck. They are also made out of breathable material to keep you comfortable and fresh all day. 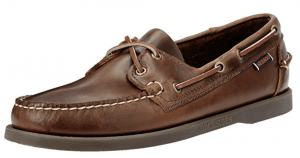 Another thing that makes boat shoes so popular is the wide range of design and style. 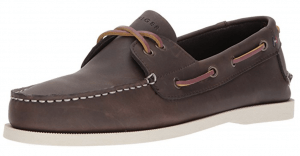 If you are particular when it comes to footwear, chances are that your perfect pair will be boat shoes. Majority of boat shoes are even classy enough to wear outside of the boat. 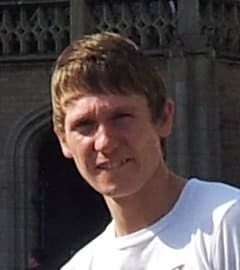 You will see in the next paragraphs by they can be the best fishing shoes for you. Here is a pair of fishing footwear that know what it means to look good and work great. The Columbia Bahama, made from canvas and leather, is a good choice for fishing shoes with its innovative design that facilitates airflow and quick water drainage. The Techlite midsole provides maximum cushioning so you can spend the whole day in action and not have to worry about sore feet. 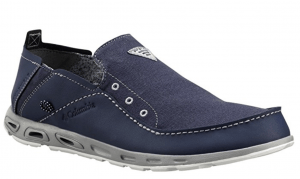 Made with 100% leather with rawhide laces, this loafer style fishing footwear is another excellent boat shoe beloved by anglers with a heightened sense of fashion. The Bowman’s rubber soles are reliable on deck, providing comfort and traction. What is great about this pair is that it can be both a lace tied and a slip on shoe. You’ll find yourself a versatile pair of shoes with the Tommy Hilfiger Bowman. A classy and functional loafer, your fishing experience will have an added spice with Sebago Men’s Docksides. Whether it is a calm day at sea or an action packed adventure in rough waters, anglers will appreciate not just the style of these shoes but also their durability. Completely waterproof and extra lightweight, you can’t go wrong with the Shimano Evair. It is designed not only for fishing but for a multitude of marine activity you can ever dream of. These shoes are constructed with molded EVA that offers maximum heel shock absorption. The Shimano Evair’s design will keep your feet comfortable and cool – you will feel so free you will think you have gone barefoot. Though technically known as hiking shoes, the Arrowood is one of the best fishing shoes around because it is so adaptable and versatile. Made with breathable synthetic mesh with a rubber sole for that extra traction, these shoes can handle any environment you will face when you are angling. The Arrowood dries quick and performs spectacularly as a fishing shoe. Its rugged design and well padded soles will make you want to use it anywhere and everywhere. More and more anglers are considering these type of shoes as their go-to fishing shoes. Generally, they are lightweight with excellent water drainage and mesh panels for air circulation. Water shoes are ideal in warmer environments. These shoes are often securely snug on your feet which make them great fishing footwear. Take a look at the following best fishing shoes under this type of shoe. Quick drying and super breathable, the Columbia Men’s Drainmaker offers a wide array of features that make it ideal in angling in hot weather. With rubber soles to help you avoid slipping on wet surfaces, a protective toe bumper, and padded collars, the Drainmaker will shield you from the elements as well as keep you extra comfortable. A massively popular fishing footwear, anglers are smitten with the Aleader Quick Drying Water Shoes. Hailed as an “all-purpose” amphibious shoe, the Aleader has an endless list of innovative features that make it one of the best fishing shoes on the market. The ingenious hydrophobic engineered mesh speeds up the drying process as well as provide total breathability for the feet. The rubber pods add extra traction so you’ll never have to fear slipping up during a fishing trip. The stitching on the Aleader’s fabric promises an ultra secure fit. And the ComforDry sockliner gives the wearer superior cushioning power. 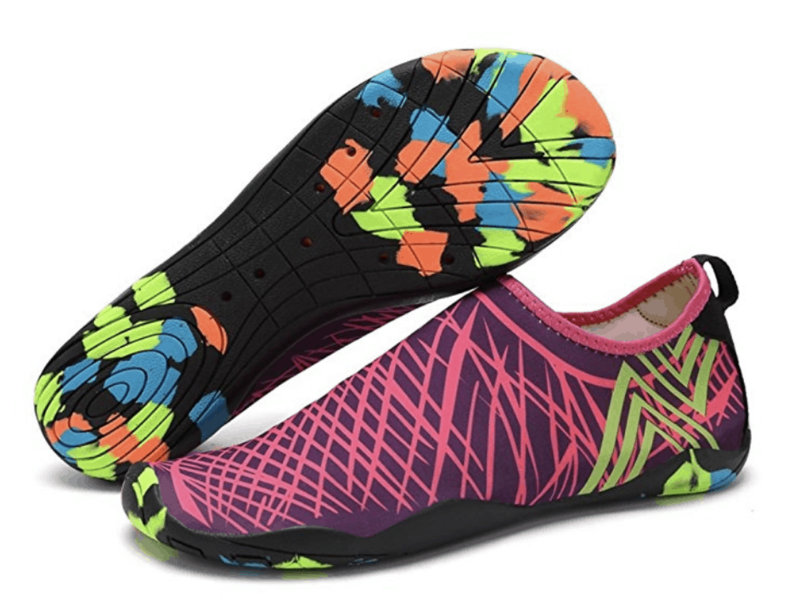 The Aleader Quick Drying Water Shoes is guaranteed to keep you bouncing on your feet, no matter the terrain. Another multipurpose fishing footwear, the Lxso Water Shoe is a polyester slip on that will give you extra traction in slippery terrain. Flexible enough to give you the freedom you need to move around but with a rubber sole strong enough to protect your feet from sharp objects, this water shoe is an exceptional choice regardless of what type of angling you prefer. The Lxso is incredibly lightweight and will wrap around your foot securely. Its drainage holes on its bottom provide a comfortable and healthy environment for your feet, the water flowing out as quickly as it comes. The Lxso’s snazzy design is perfect for those looking for fishing shoes with a little more personality. 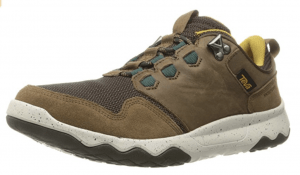 Definitely a shoe made for adventuring, this fishing footwear is made from a combination of leather and synthetic material for better performance. 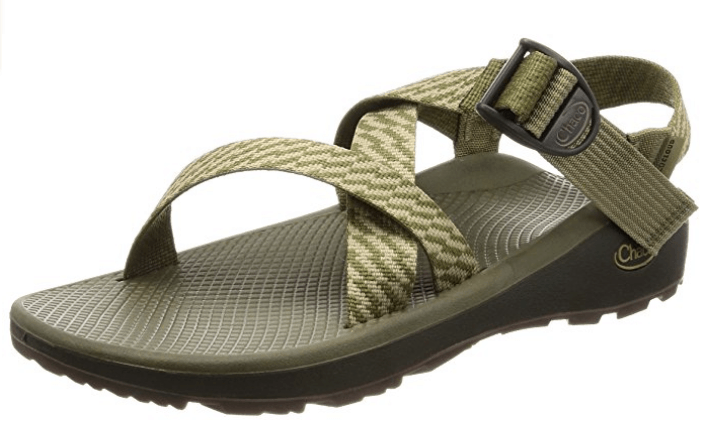 The Teva Men’s M Evo is light on your feet, lined with breathable textile, and a non-marking spider rubber outsole. 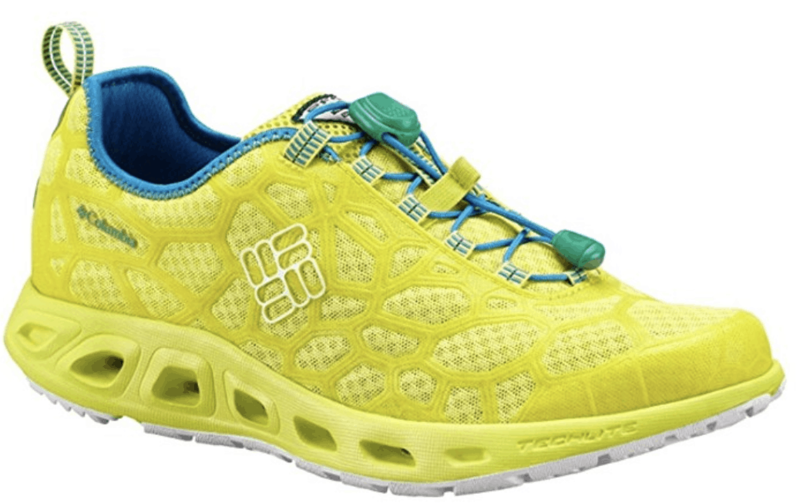 Its molded IMEVA midsole offers superior shock absorption as well as exceptional comfort. The Evo works well in water and in rugged terrain so this might just be the best fishing shoes for you. 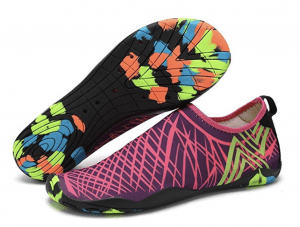 An incredible unisex water shoes, the Cior Water Sports Shoes, despite it lightweight style, packs quite the punch. Equipped with thick rubber soles to protect your feet when you’re walking across a rocky terrain and high quality fabric to wrap your foot comfortably, you’d be making a good choice with these fishing shoes. Its breathable polyester and spandex blend will keep your feet cool during long fishing excursions. 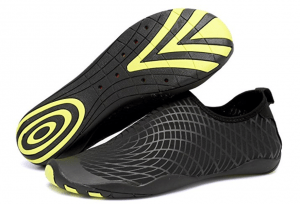 If you are the type of angler who needs to be constantly on the water, mesh shoes might be better suited for you. They are not a hundred percent waterproof but they have perforations that encourage good air circulation. Your feet will not be as trapped with mesh shoes. As an added bonus, you will even avoid the health risks associated with unattended feet care. Check out our recommendations below and see if they are the best fishing shoes for you. This classic lace-up shoe with Hawaiian roots is lightweight with a good and steady rubber outsole that’ll give you all the support you’ll need on the water. 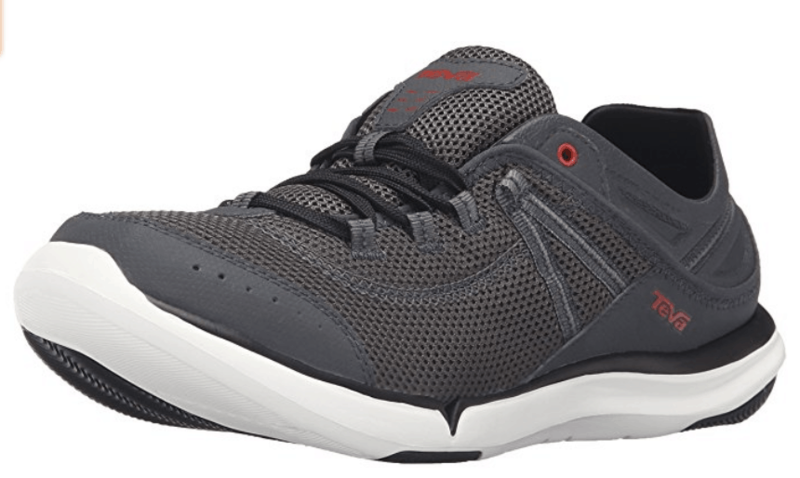 Easy to put on but fits securely on your feet, the OluKai Nohea is designed with a breathable synthetic mesh and an anatomically contoured insole. These fishing shoes can withstand all types of weather and it’s subtly stylish to boot. Not only does the Uminder Xiang Guan have natural rubber soles that are ultra slip resistant, its environmentally friendly suede leather makes it breathable and comfortable enough for superior angling performance. No matter how slippery or uneven the surface, the Uminder Xiang Guan has got you covered. These shoes even have a double closed toe cap to protect your feet from sudden collision. These shoes are not only great for fishing but for any outdoor activity you might want to try. Soft, comfortable, and with excellent grip and traction, the Under Armour Kilchis is another great choice for fishing footwear. Its elastic lacing makes it easy to put on and take off. 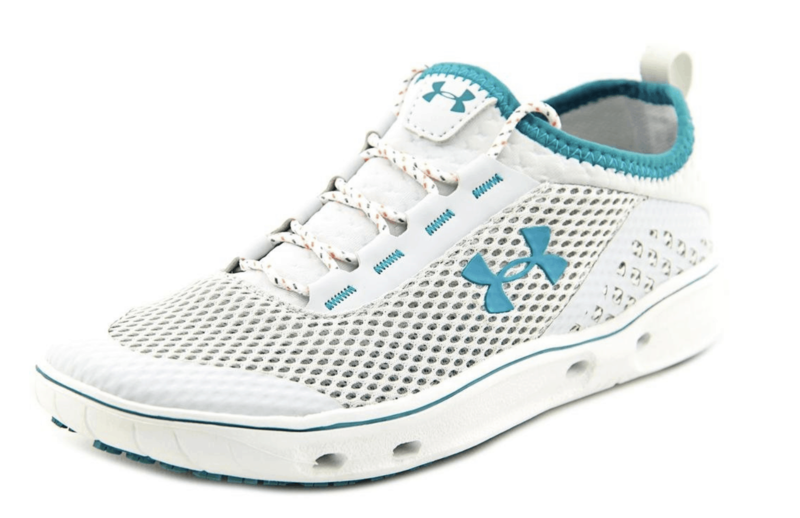 The Under Armour Kilchis are super breathable and quick to dry too with its synthetic mesh. What’s more, these shoes come in a wide array of different colors so you’ll have plenty to choose from. Another innovative brand that knows what serious anglers want and need, the Columbia Megavent Dorado features the latest in footwear technology. From its midsole ports that encourages extra air flow and water drainage to its Blood ‘n Guts treatment (for water and stain resistance), this is a pair of shoes that thought of everything. It’s well ventilated yet tightly secured so you can cast off without worry. This is definitely a pair of shoes to seriously consider. This is a specialized type of fishing shoe that’s mostly used in fly fishing. These are waterproof and often covering your feet up to your ankles (some even up to the hips). Wading shoes or boots might not be as stylish or multifunctional as the other types of fishing shoes. But, it does a superb job as a fly fishing footwear. 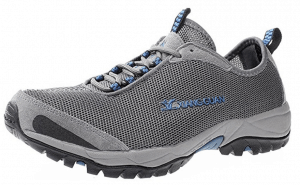 Take a look at some of the best fishing shoes under wading shoes or boots. 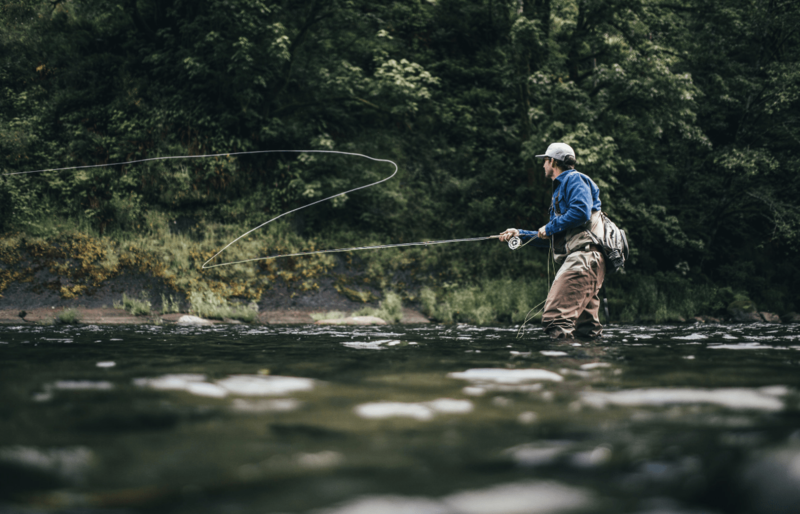 From a brand with a long history of quality footwear production, the Caddis Northern Guide Wading Shoes is one of the top choices for fly fishermen. The EcoSmart II Soles are environmentally friendly so you can wade through the water for hours without unintentionally disturbing the aquatic life. Not to mention the soles are designed not to track mud too. The footbed is cushioned for maximum comfort and the inside of the shoe can stay dry all throughout the fishing trip. With its excellent traction and reinforced toe cap and heel, the Caddis Northern Guide is no doubt wise choice. 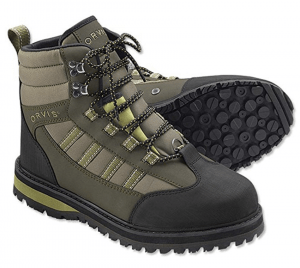 Though commonly billed as the wading shoe for novice anglers, the Orvis Encounter is anything but a simple boot. These shoes are comparatively lightweight to accommodate those just beginning to get a hang of the sport. However, the cushioned ankle support, scratch rubber toe cap, and fully lined interior are also fully appreciated by veteran anglers. 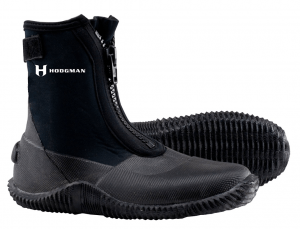 From one of the most trusted brands of waders and other outdoor boots, the Hodgman Neoprene is an ideal footwear for anglers wading in colder climates. Your feet are fully secured and insulated with these boots. Tiny stones or sand cannt get in to these comfortably fit boots and the strong rubber soles and durable toe cap will protect your feet throughout the day. The Hodgman Neoprene’s zipper is also as durable as the rest of the boot so no worries there. If you are looking for fishing footwear that is reliable and designed to last long, these shoes are for you. 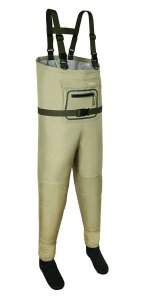 LaCrosse Trapline Hip Waders For dedicated extreme anglers who need total protection from the elements, these waders are a popular choice. The LaCrosse Trapline are made from heavy-duty rubber and are insulated by a wool-felt lining so anglers can stay warm and dry even in ice cold water. 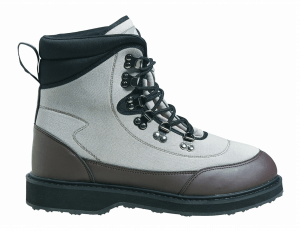 This heavy-duty boot has a Trac-Lite sole for superb traction regardless of weather conditions. The LaCrosse Trapline is secured at the waist so anglers won’t have to fear accidentally losing their boot on rough waters. Allen Company Blue River Wader Another completely waterproof wader, the Allen Company Blue River Wader is functional yet also fairly light and easy to put on and take off. Made for warm weather condition, these waders have several convenient pockets and an articulated knee for ease of movement. 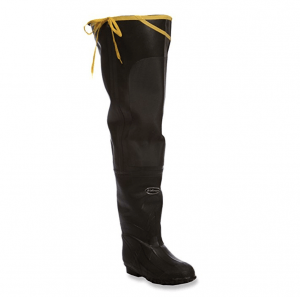 Anglers in warmer areas but also value a waterproof footwear will love this summertime wader. Lastly, these type of fishing footwear is more casual than the others. 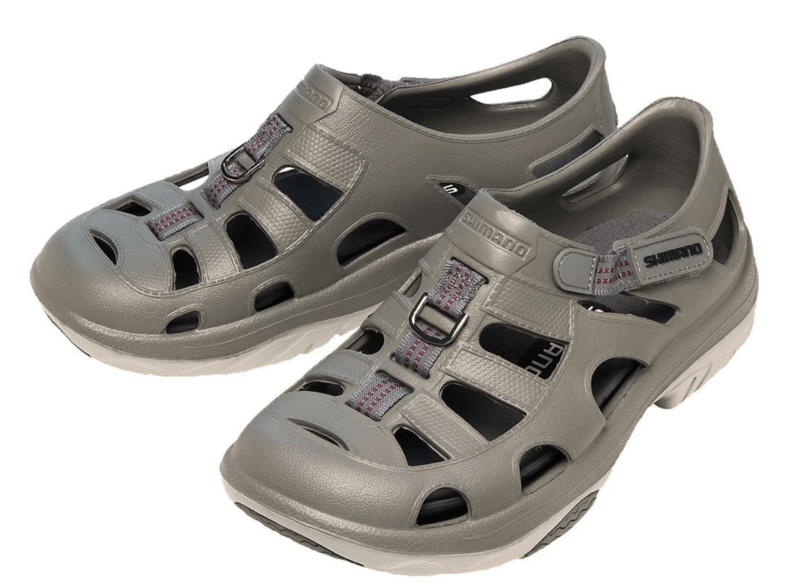 Designed to be open to the elements, aquatic sandals are the preferred footwear for anglers in areas with warm weather. For many. clunky footwear can get in the way of their fishing performance. A simple, open air shoe is the best fishing shoes for anglers that love to rough it and be one with nature. OluKai Kapua Sandal On the outset, the OluKai Kapua Sandal looks like a simple leather sandal. However, these beauties feature so much more than the average flip-flop. Its midsole is anatomically molded and the soles are inlaid with leather and have rubber traction pads. 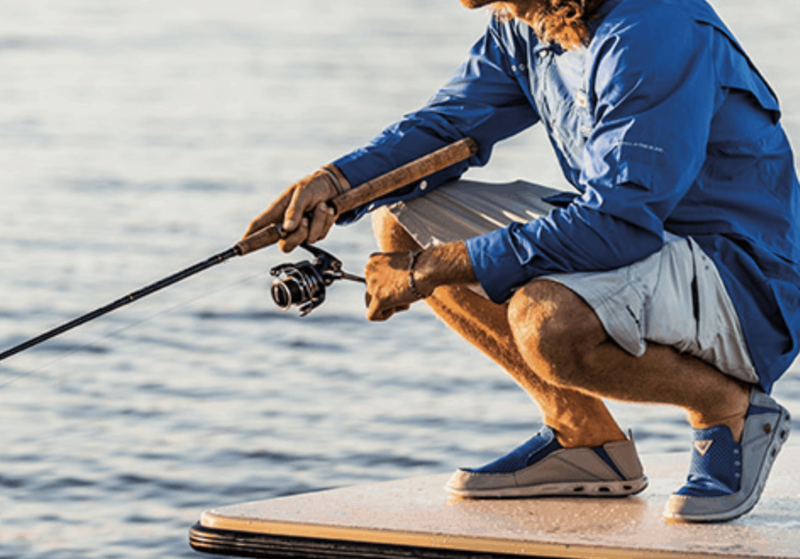 As a fishing shoe, the OluKai Kapua is sleek, comfortable, and reliable. 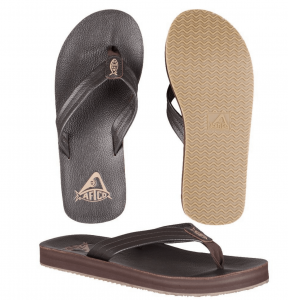 AFTCO Beachcomber Sandal Great on deck and off of it, the AFTCO Beachcomber Sandal is a cozy flip-flop for the easygoing angler. The top of the line nubuck uppers and skid-resistant soles are perfect for fishing. 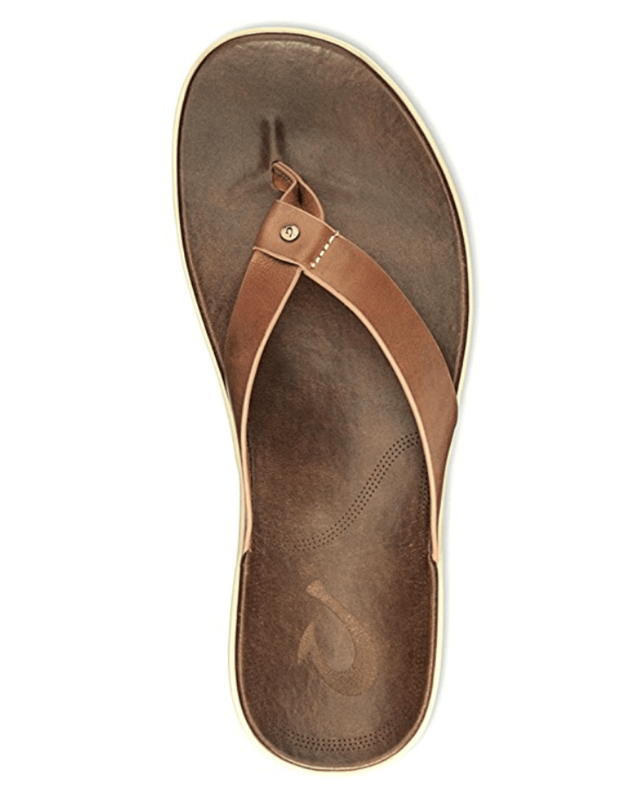 The Beachcomber also has incredible arch support for a comfortable feel. Chaco Men’s Zcloud Sport Sandal If you are not so sure about flip-flops and want something with more security, consider the Chaco Men’s Zcloud Sandals. These sandals have durable polyester adjustable strapping so you won’t have to worry about your sandals slipping off accidentally. The ChacoGrip outsole offers extreme traction, even on wet surfaces, and the specially designed footbed has a contoured arch support to give every step extra cushioning. 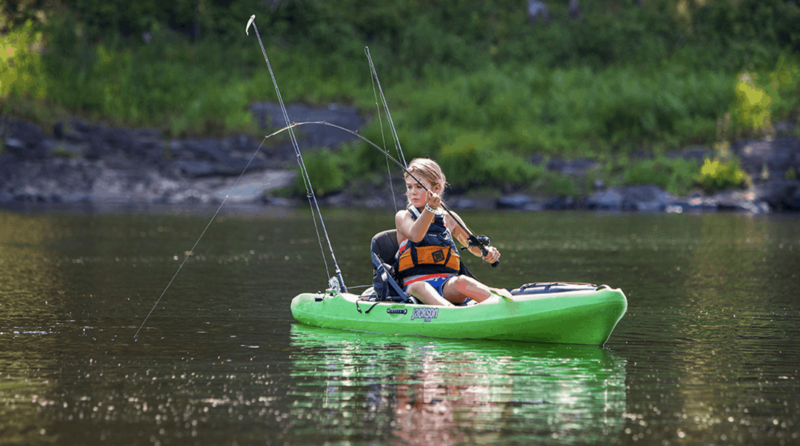 Great for fishing and for regular activities, the Zcloud is a definite must try. The best fishing shoes will keep you safe and help you avoid any pains. When you are fishing all day, you need your feet to remain as comfortable as ever. You would want no aches, no pains, and no slipping on the decks or on your boat. And no soggy feet! 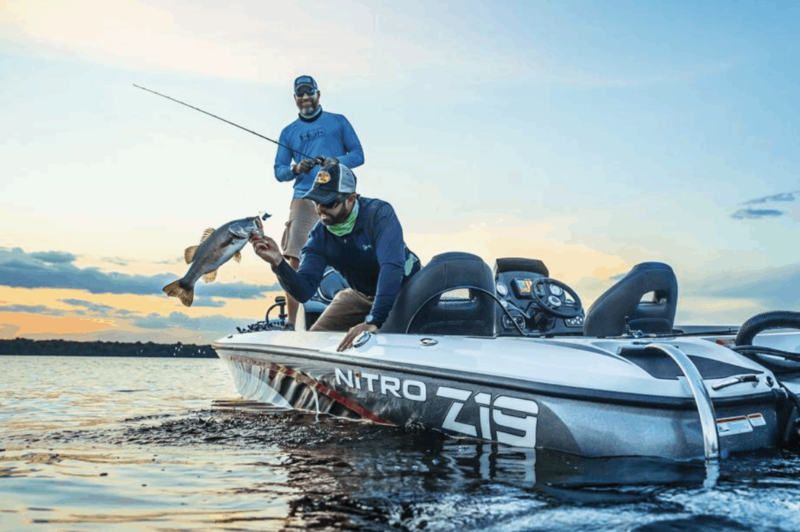 For most of anglers, when they are fishing or boating, the comfort and style go hand-in-hand. You may prefer the sandals or slip ons, or you might need a heavy-duty boots. When it comes to the best fishing shoes, to each is his or her own. The best fishing shoes will mostly depend on your preference and style. You just need to choose the pair which you think would be most appropriate for you. Just keep in mind all of the tips we have mentioned above. And if you want, just make your pick from the above-listed fishing shoes. That’s about it. Happy Fishing! p.s. Please check out The Best Fishing Paddle Board.